It was practically a foregone conclusion that I was going to like the Pentel Finito, a fine-tipped, porous-point pen. Like other porous point pens, such as the BIC Intensity or the Sharpie Pen, the Finito produces a clean line that manages to make any handwriting look neater. It’s fully disposable, but it has the benefit of being a little thicker than an average plastic-bodied pen. So, it’s comfortable to use and seems fairly durable. Unlike most porous-point pens, the Finito uses a feed system that helps keep the ink flowing smoothly, but having a feed sometimes can help a little too much. Given that it’s labeled as an “extra fine” pen, it produces a thicker line than one might expect. The Finito also suffers from some smearing and bleeding issues, though nothing I’d consider out of the ordinary. It’s a good pen and one that I’d recommend, but, in my experience, the Finito is difficult to find in stores – I had to order a box online. On the other hand, the Pilot V Razor Point, a very similar pen, is quite common. So even though the Finito is a bit longer, thicker, and sturdier than the V Razor Point, you might as well grab whichever you can find at your local drug store instead of shelling out extra money for shipping fees. 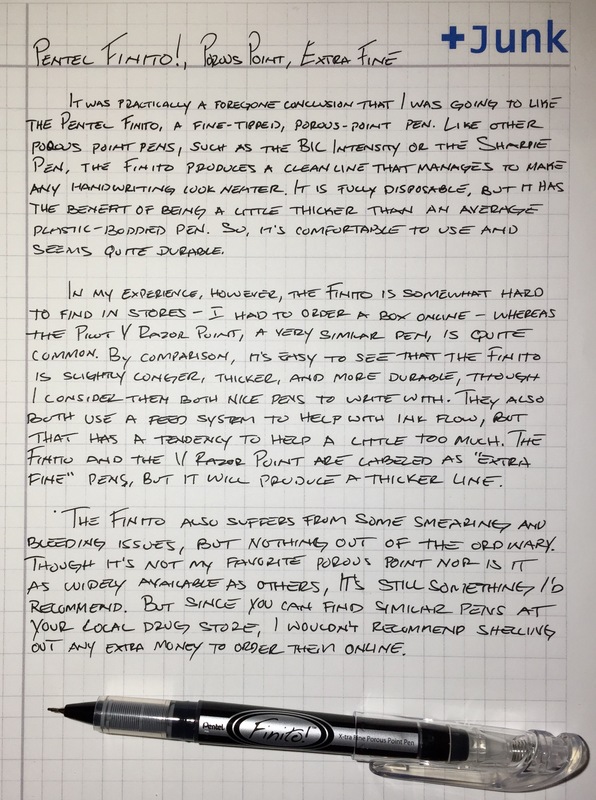 A review at A Pen a Day says that the Finito bleeds through paper less than the Sharpie Pen. That’s probably true, but expect bleeding from both if you’re using thin or cheap paper. The Pen Addict also laments the fact that the Finito can be difficult to find and complains of massive ink flow and bleeding. I wouldn’t call the ink flow “massive,” but, as I noted, I definitely wouldn’t call it “extra fine” either.